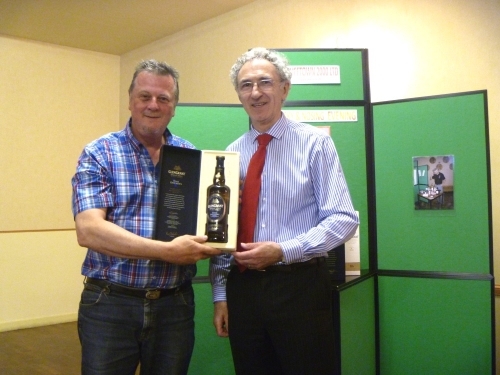 Dufftown 2000 held it's first Nosing & Tasting of 2014 on 25th June in the Commercial Hotel. A small but dedicated number of whisky enthusiasts enjoyed a Tour of Scotland in 5 Drams. 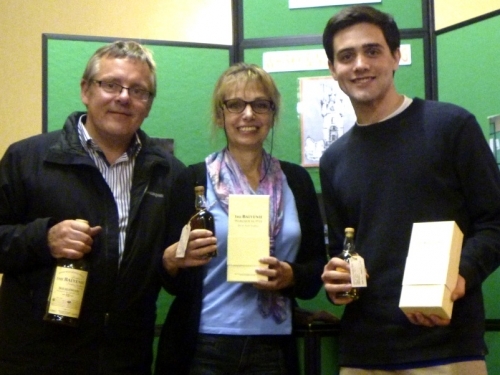 The winners from the USA are shown below receiving a bottle of single malt from Steve Oliver who did the presentation. Dennis Malcolm,General Manager of Glen Grant presented a selection of great single malts to the audience, including his own creation "5 Decades",bottled to comemorate his 50th year in the whisky industry. The large number of visitors enjoyed the evening and the winner from Switzerland was presented with a bottle of "V Decades" by Dennis. A full house was waiting for Andrew Sim, Production Supervisor at Tomintoul Distillery. Andrew brought along the core bottling's - 10yo, Portwood & Oloroso finishing, the superb 16yo and Old Ballantruan. 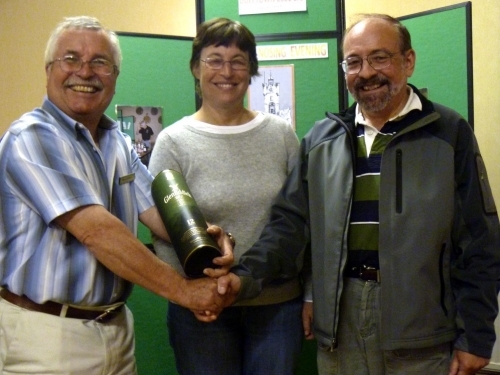 After a film show and the tastings, the nosing competition winner was given a Tomintoul 16 as the first prize. On 20th August Callum Purcell, Warehouse Manager from BenRiach brought along 6 great single malts including the newly marketed 12yo Sherry Wood. All malts ere well enjoyed by the full house of oversees visitors. 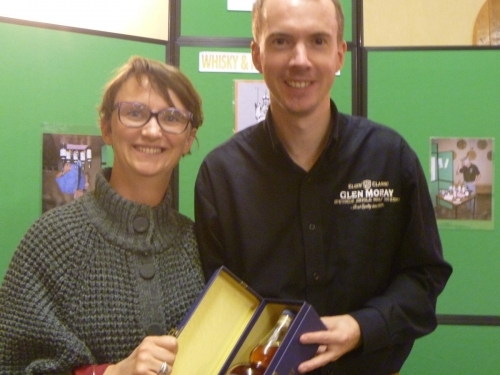 The winner of the blind nosing competition was Sabine Bouman of France, here seen with Callum collecting her prize. Another full house was waiting for Iain Allan, Visitor Centre Manager from Moray Disillery. He introduced great single malts and the very latest Glen Moray at 61.8% now available at the distillery. 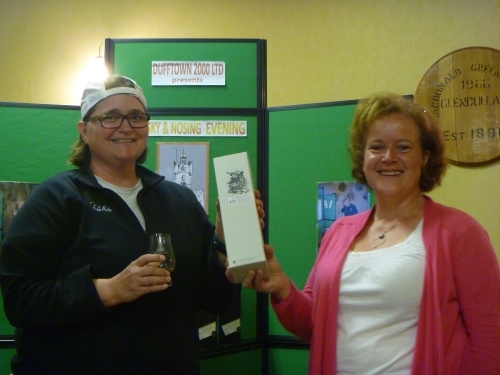 The visitors from all over Europe enjoyed the drams and the winner of the Nosing Competition was Fanny Verdu who had all 6 drams in the correct order. She is here received Glen Moray's latest Burgundy Cask Strength bottling from Iain. Mike Patterson, Sales Manager of Gordon & MacPhail Independent bottlers in Elgin welcomed 35 visitors from as far as the USA, Canada, South Africa & Australia for the G&M selection of single malts. Mike did an exceptional job in introducing, Glenburgie, Dufftown, a peated Bunnahabhain, Speymalt from Macallan and the evenings favourit Benromach 10yo. The winner after a "nose-off" competition was Lindy Labuschagne from South Africa who had all Nosings correct. 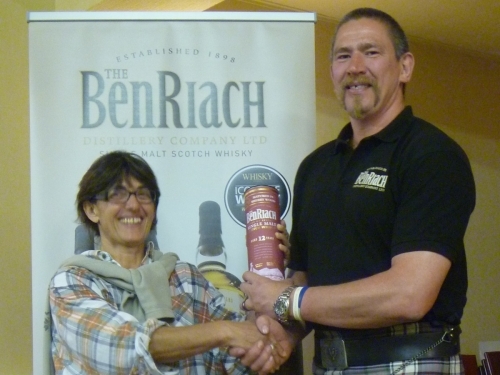 She is here receiving her prize, a bottle of Benromach 10yo for the competition from Mike. The last Nosing & Tasting of 2014 had also the biggest audiance. Steve Oliver introduced Glenrothes to an audience of 36 oversees visitors from as far as Australia and Alaska. The majority of the people rated the Glenrothes Alba & the 1995 the best drams of the evening. 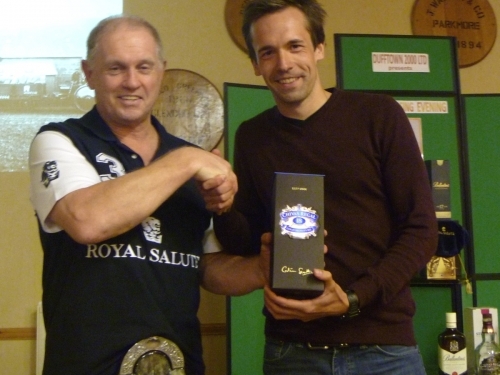 The winner of the Nosing competition "after a nose-off" was Kai Stutzkeitz from Germany here presented with a bottle of Glenrothes Select Reserve by Steve. Antonia Bruce, Sales Manager from Adelphi Distillery presented 4 single cask bottlings to the audience - Mortlach 1987, Bunnahabhain 1989,Miltonduff 1981 and a very strong Glenrothes 7yo. The winner of the nosing competition won a bottle of Fascadale. David Mair, Brand Ambassador of The Balvenie brought along a superb selection of Balvenie's for the visitors - the DW 12yo, DW 17yo, Caribbean Cask 14yo and the Portwood 21yo. 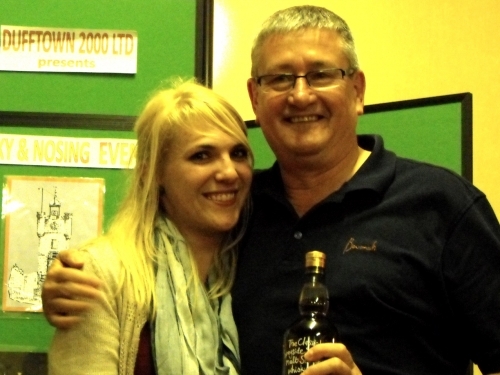 The Nosing Competition winners are shown below receiving a special bottling from Warehouse 24. In addition there were more prizes during the "quick-answer" session. 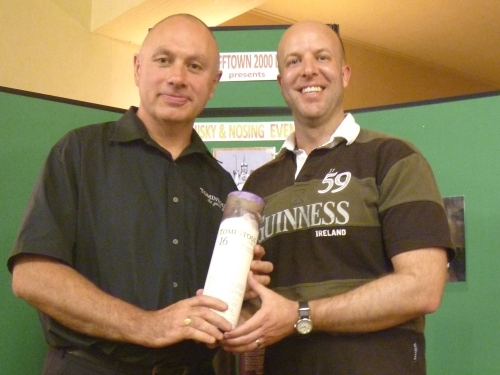 Steve Oliver carried out the duties of presenting Diageo's Cragganmore selection, for the 6th N&T of the season. Those present from as far as Australia enjoyed the evening, tasting Cragganmore 12yo, Distillers Edition, a Friends of Classic Malts bottling and the Johnnie Walker Double Black, "World's No 1" Blended Whisky. 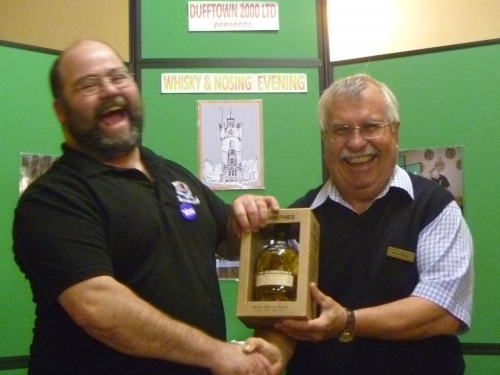 The winner of the Nosing Competition is shown here receiving a bottle of Cragganmore 12yo from Steve. Another full house was welcomed by René Ramón and Steve Oliver who presented the Cardhu selection from Diageo. 5 single malts including the 12yo, 15yo, 18yo, a Special Cask Selection and Amber Rock which was new for a lot of people. 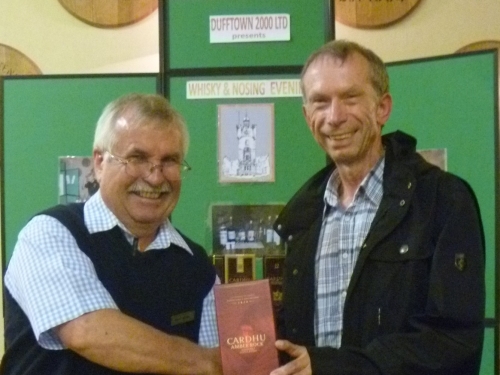 The winner of the Nosing competition was Rolf Kaestner from Germany here seen with Steve receiving a bottle of Cardhu Amber Rock as the first prize. A near full house welcomed Chris Brousseau, Chief Archivist of Chivas Bros at Strathisla for first ever Blended Nosing & Tasting event in Dufftown. The selection was Balantines, Chivas Regals and Royal Salute whiskies. The audiance enjoyed all the drams but the favourits were the Balantines 17yo & the Royal Salute 21yo. 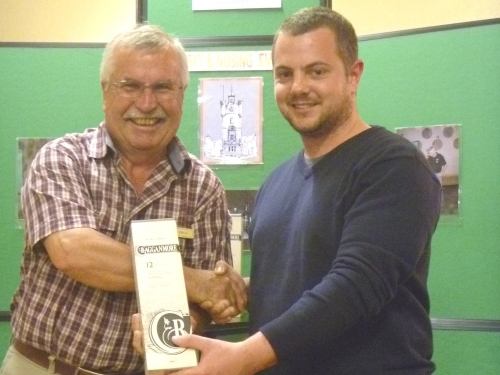 The Nosing competition was won by Peter Elsesser from Germany here presented with his prize from Chris. Chris Jameson, winner of the Glenfiddich Nosing competition. Jennifer Proctor, Head Guide at Glenfiddich distillery introduced the Glenfiddich 14yo Rich Oak, GF 15yo cask strength Solera, the GF Malt Masters Edition, the GF 18 & 21yo single malt and a special bottling of GF peated whisky. The audience enjoyed the malts very much and Jennifer was applauded for an excellent presentation. 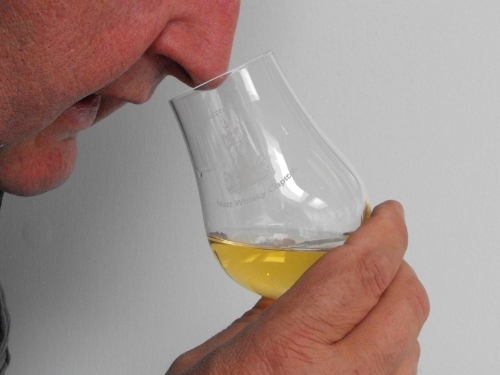 The winner of the Nosing competition was won by a local for the first time. 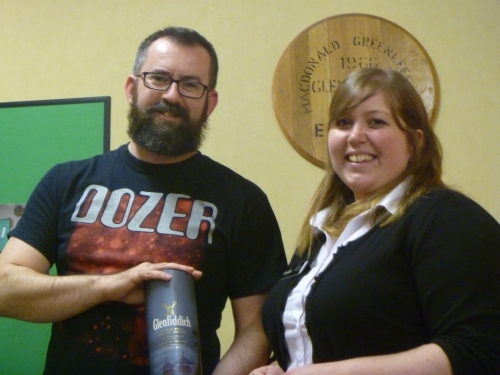 Chris Jameson is shown here being presented with a GF Distillery Edition bottle by Jennifer. That's what its all about, Nosing and enjoying your whiskies ! Dufftown 2000 Ltd. would like to thank all the Distilleries and Independent Bottlers for giving their time and product this year. All the income from these 13 weeks of Nosing & Tastings goes directly towards the refurbishment of the Dufftown Whisky & Heritage Centre in Conval Street. It has been very successful this year with hundreds of people coming from all over the world to enjoy an evening in the town appreciating excellent drams whilst also helping our local charitable organisation.